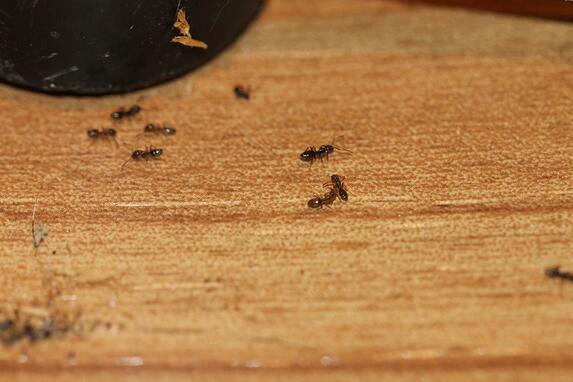 Nothing kills a delicious dinner quite like seeing a trail of ants walking across your kitchen counter. Before smashing the ants to their untimely death, ask yourself, do you know what type of ant it is? Since ants are social insects, their colonies are organized into complex societies with a division of labor among the different castes making them often difficult to control. If you can correctly identify what type of ant is invading your home, you’ll be able to better understand the treatment options for that species. What Ants are Commonly Found in New Jersey and Pennsylvania? There are several different species of ants that are commonly found throughout New Jersey and Pennsylvania. Even though most of the ant species are considered nuisance ants, there are species that can actually cause structural damage to your home. Although having any type of ant in your home is an annoyance, only carpenter ants and acrobat ants can cause structural damage to your home. Of the two, carpenter ants are the more serious than acrobat ants because they will destroy sound wood in addition to wood that has been weakened by moisture damage. Acrobat ants tend to cause less damage and are usually associated in areas of the structure where moisture is a problem. Have you ever crushed an ant and noticed that it smelled like coconut or had a “solvent-like” odor? If so, then you have probably had your first encounter with an odorous house ant. Odorous House ants are small, about 2.4 to 3.3 mm in length, dark brown or black in color that are often confused with Pavement Ants. They can be found invading homes in very large numbers and will forage for food day or night. They can nest just about anywhere and those nests can be very large in size, which can make them difficult to control. Like Pavement ants, Odorous House ants also like sweets (especially plant nectar and honeydew, which comes from aphids) and are harmless. 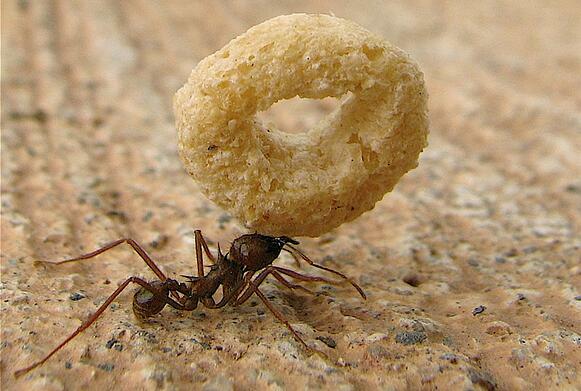 As far as diet goes, Pavement ants prefer sweets but they will eat just about any food they can find. They will eat greasy foods, many foods consumed by humans as well as live or dead insects. 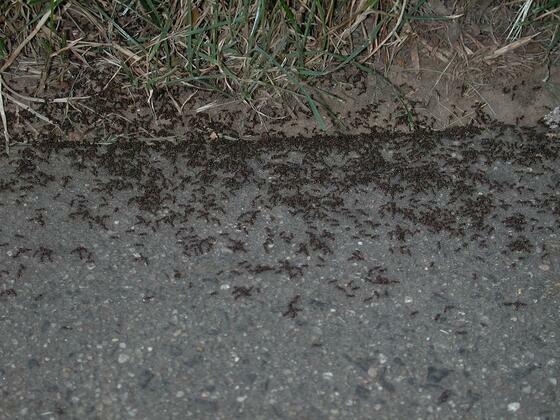 Pavement ants workers can become a nuisance when large groups of workers forage for food inside your home. These ants are harmless to you and your home, but they are considered a nuisance. 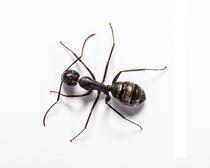 Carpenter ants pose a much greater risk to your home than any nuisance ant ever could. Carpenter ants are a wood-destroying insect that attacks the wood that makes up the structure of your home. Carpenter Ants are among the largest ants in the United States measuring 3.4 to 13 mm in length. They are typically black in color but some species may be red, orange or a combination of these colors. 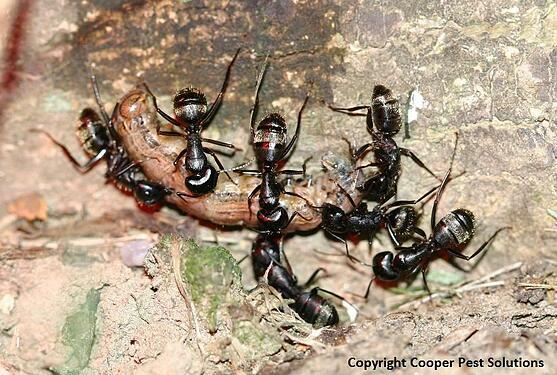 Even though Carpenter Ants are a wood-destroying insect, they don’t actually eat the wood. Instead they spit the wood out as they tunnel through it to create their nest. Their diet consists of food that people eat, including sweets and meats. They also prey on other insects and small organisms such as caterpillars, crickets, earthworms, etc. Carpenter Ants play an important role in the environment by acting as major decomposers of dead or fallen trees within the forest, however, since they are very efficient destroyers of wood, they can become a very serious economic pest when they enter manmade structures. Perhaps you’ve tried the typical DIY remedies with little to no success, at Cooper Pest Solutions we understand the biology and behavior of ants, which helps us to successfully eliminate ant colonies. What makes us different is that we focus on the exterior where ants originate, rather than inside where the ants are seen. By doing this, we solve ant problems rather than simply treat the symptoms. We offer several different types of services that will address your ant problems. One-time services will include proper ant identification by one of our skilled technicians followed by a treatment protocol that corresponds with that species. In most cases, the service can be conducted primarily from the exterior of the home with little or no treatments indoors. “Generally customers can expect to see a 50 percent reduction in ants within three days of treatment and complete elimination within 7-10 days,” said Dave Burgess, Vice President of Operations at Cooper Pest Solutions. Burgess added that although treatments for ants may be similar, there are differences in treatment protocols depending on the species you have invading your home. One-time services provide coverage for up to 90 days, however if you would like future treatment and prevention methods for ants, Cooper Pest Solutions suggest our Home Traditional or Home Intensive services. Schedule service online today for fast technician dispatch. No consultation or estimate is needed to get started. This service does not include carpenter ant control. The Home Traditional and Home Intensive services at Cooper Pest Solutions not only cover ants, but a wide variety of other insects as well. Both services include year-round preventive pest control with services conducted four times a year. You will receive three exterior maintenance treatments on the exterior of the home for spring, summer and fall (March-November), in addition to one interior service during the winter months (December-February). The Home Traditional service includes ants as well as many other crawling insects, mice and wasps. If your home is in an area that is prone to carpenter ants, which can cause structural damage to your home, it is suggested that you enroll in Cooper’s Home Intensive services that includes carpenter ants and much more. If you have or suspect an active carpenter ant colony is on your property, Cooper Pest Solutions will send out one of our highly-trained technicians to perform a detailed inspection of your property. We will then implement our Carpenter Ant System, which is exclusive to Cooper Pest. The program focuses on the exterior of the home, where we identify ant trails and entry sites into the home then apply bait and a low-toxicity residual material that ants will take back and distribute throughout the colony, eradicating the carpenter ants from your home. Once the ants have been removed through the Cooper Carpenter Ant System, your home will then fall under the renewal program from Cooper Pest that provides you with preventive services and protection from any potential re-infestations. Schedule carpenter ant services at your home for fast technician dispatch on the day of your choosing. No inspection needed. If you don’t have carpenter ants on your property, but would like prevention services for carpenter ants as well as other insects, you can enroll in Cooper’s Home Intensive program that includes carpenter ants, stinging insects, rodents and crawling pests. Why Should I Call Cooper Pest Solutions? Regardless of what insect you have, you want to choose a pest control company that knows and understands the biology and behavior of the insect they are servicing. At Cooper Pest Solutions, we have a staff entomologist who is always at the forefront of the latest science and technology for pest control. We develop our treatment services based off of scientific research and limit the use of pesticides whenever possible. If ants are causing a nuisance at your New Jersey or Pennsylvania home or you would like to prevent you property from ants and other insects with our home service programs, give Cooper Pest Solutions a call at 800-949-2667. To schedule a FREE estimate, fill out our form here.